Our rewirable circuit includes three modules: an input module, a processing module and an output module. 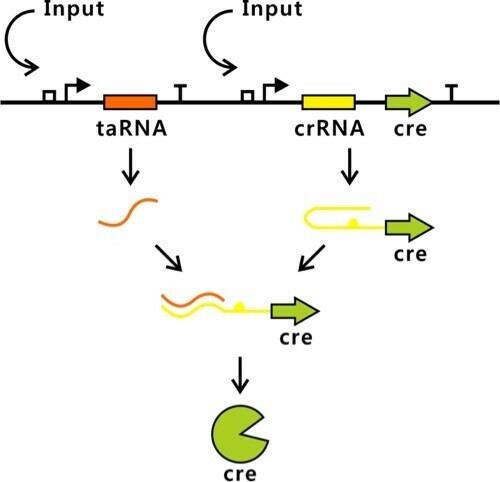 For input module, which is supposed to prevent the leaky expression of Cre protein, it is composed of taRNA, crRNA, Cre protein and corresponding promoters. We use the standard method of biobrick connection to generate the input module. During the process, of course, standardized crRNA cannot be found in the Plate Kits and it is tough for us to get and restandardize, so, we decide to synthetize this small segment by PCR (as shown in protocol). Luckily, we have found the optimal condition and get the crRNA which is standardized, and finally finish the construction of input module. For processing module, which is one of the toughest parts in our project, one is composed of three repressor genes---lacI, tetR and cI, their corresponding promoters and two recombination sites; another is composed of three genes related to generation and degradation of AHL molecule---aiiA, luxR, luxI, their corresponding promoters and two recombination sites. Due to the design of this circuit, we have to connect two genes reversely to put their corresponding promoters between lox71 site and lox66 site. To this end, we come up with a strategy that one segment is digested by EcoRI and SpeI, another segment is digested by EcoRI and SpeI and the vector is digested by XbaI and PstI, and finally do a ligation to finish our processing module. As to output module, we design two methods to detect whether our processing module works or not. One of them is fluorescent protein, we used mCherry protein and Cyan Fluorescent Protein to detect the expression of two promoters simultaneously; and due to the half-life of fluorescent protein and its quenching, which may interrupt the result of repressilator or positive-feedback loop(the names of our processing module), we design another detection device---fluorescent RNA, which is a complex of RNA aptamers and fluorophore. 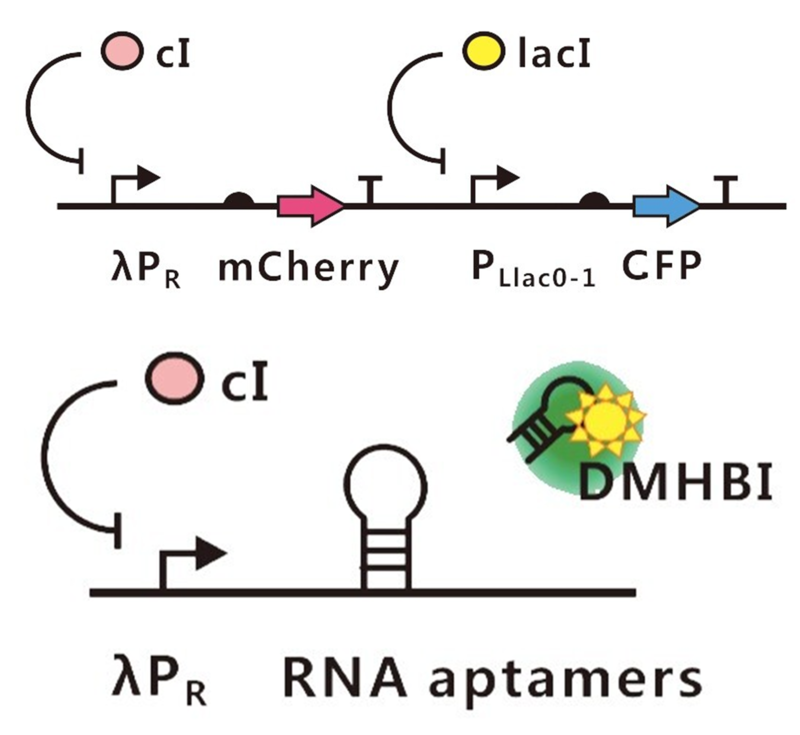 We synthetize the fluorophore with the help of Xie Hanchang and Xu Yuanyuan through chemical experiments and we synthetize the RNA aptamers which is standardized by company.